Nothing will make you feel more like a full-fledged adult than the proper kitchen tools. If you’re gearing up for graduation and preparing to mourn the end of campus life, at least you can look forward to that real-life apartment (and kitchen!) that will finally make you feel like a full-fledged adult. We may be a little biased here, but we think that shopping for your first kitchen is one of life’s greatest joys – and you only get to do it once. While you may have to wait until move-in day to buy that perfectly-sized couch, the rug that will be positioned just-so and the art that will line your walls, the kitchen? That you can start shopping for right now. From bright mixing bowls to the perfect French press, these are the 15 must-have items to add to that graduation wish list. Whether you’re whipping up some scrambled eggs or making a full-on chicken dinner, invest in a stovetop set that will have you channeling your inner Julia Child. Don’t be boring when it comes to your linens. Choosing colorful dish towels is the easiest way to infuse some pizazz into your cooking space. This classic collection is a cooking novice’s Bible; it will guide you through everything from Sunday morning pancakes to late-night pasta. Keep it classic when it comes to your coffee. Instead of an electronic coffee maker, invest in a French press. Perhaps the biggest splurge of the bunch, a standing mixer will be your most treasured lifelong purchase. Bake cookies, whip up some frittatas or knead dough for a batch of bread. No matter what you’re cooking, this mixer will do it best. No, you can’t use your butter knife for everything. Instead, get yourself a block of assorted slicers and dicers that will last for a very long time. Let your cutting board do double-duty by opting for one that looks cool enough to use as a serving platter as well. Why buy one mixing bowl when you can buy six? Whisks, spatulas and all the essential kitchen utensils are here for you in their silicone glory. Buy a whole set in a fun color to liven up your baking prep. No recipe is finished without oven mitts to remove your meal from the oven. Repeat after us: dish towels do not cut it. Opt for simple sets that come in bulk to aid all of those messy post-grad dinner parties you’ll be hosting. There’s no need to overspend on flatware. Make sure you have enough spoons for all those late-night mac and cheeses and plenty of forks for the ramen you’re going to microwave (sorry, Mom…). 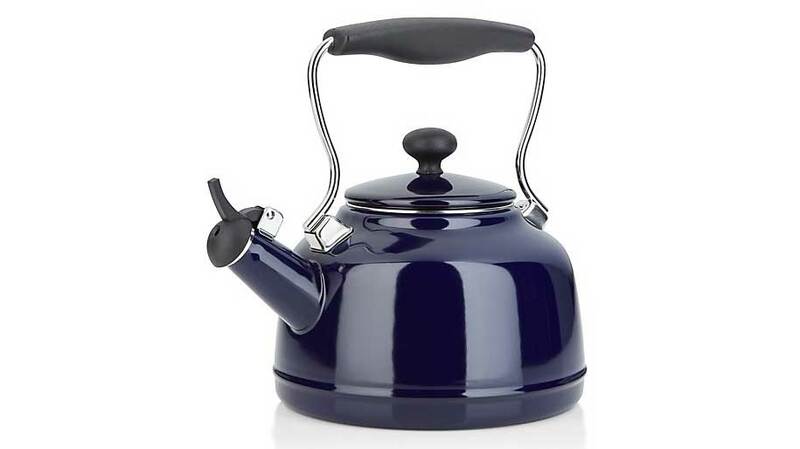 Whether you’re cooking instant noodles that remind you of your dorm room days or classing it up with a good cup of Earl Grey tea, a reliable tea kettle is essential for several of your after-college kitchen needs. Why go boring with stainless steel? Whether you’re portioning out some cinnamon for your oatmeal or scooping flour for scones, make sure you look chic doing so.